PGR development has recently acquired a range of online courses on Research Integrity, produced by the Epigeum group. These courses are designed to give postgraduate and post-doctoral researchers an essential understanding of responsible research practices in their area of study and aim both to give new Researchers an introduction to good practice in research, and to help PGRs prepare to advance their research career. The package includes five separate modules that cover the areas of Arts and Humanities, Biomedical Sciences, Engineering and Technology, Natural and Physical Sciences and Social and Behavioural Sciences. 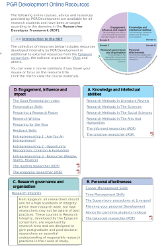 Links to a useful range of PDF resources from Vitae. Many resources can now be accessed directly, but some will require a University password. The packages on Research Writing and Presentation are currently under revision. This entry was posted in Uncategorized and tagged Online Resources, Research Integrity, Research Skills by Shirley Cooper. Bookmark the permalink.